According to the U.S. Census Bureau, roughly 275 establishments operate in this category. Industry-wide employment in 2000 totaled 22,568 workers receiving a payroll of almost $800 million. Within this workforce, 18,308 of these employees worked in production, putting in almost 40 million hours to earn wages of more than $587 million. Overall shipments for the industry were valued at almost $2.5 billion in 2001.
terms of shipments. Wisconsin ranks second in terms of shipments. Hourly wages between these three states did not vary significantly during this period. Workers in Ohio were paid the highest hourly wage, compared to Pennsylvania and Wisconsin. Throughout the industry, hourly wages averaged $14.80 in 2000. The Bureau of Labor Statistics projected a bleak future for this industry's occupations. Except for industrial machinery mechanics, sales workers, millwrights, and industrial production managers, all other occupations were expected to face reductions in employment levels. The many steel foundry occupations expected to face over a 10 percent reduction in the early 2000s included general laborers, grinders, precision workers, blue collar worker supervisors, mold assembly and shakeout operators, inspectors, metal pourers, truck operators, grinding machine operators, furnace machine operators, welders, assemblers, hand workers, electricians, material handlers, and janitors. Leading the U.S. industry in overall sales was Dallas-based Commercial Metals Co., with 7,873 employees and sales of just under $2.9 billion for its fiscal year ended August 31, 2003. Worthington Industries Inc. of Columbus, Ohio, followed Commercial Metals, with 6,700 employees and just over $2.2 billion in sales for its fiscal year ended May 31, 2003. Rounding out the top three industry leaders was Pittsburgh-based Allegheny Ludlum Corp., a subsidiary of Allegheny Technologies. Allegheny, which employed roughly 6,000 workers, sought to capture market share by setting up a production line at its Massillon, Ohio, plant (acquired in 1998 from Bethlehem Steel Corp.) capable of producing 72-inch wide stainless steel coiled plate. Allegheny was the only producer of such a product at this width. Other industry leaders included Inco United States Inc. of Saddle Brook, New Jersey; New York City-based Renco Corp.; and Nucor-Yamato Steel Co. of Armorel, Arkansas. 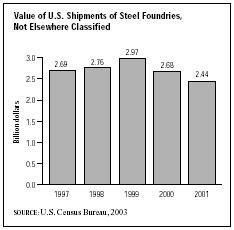 Carbon steel castings accounted for 43.6 percent of industry shipments in 2001, while high alloy steel castings accounted for 21.8 percent, and other alloy steel castings accounted for 24.2 percent. Approximately 4 percent of the market was non-specific in 2001. Between 1997 and 1999, total industry shipments increased from $2.69 billion to $2.97 billion. When the U.S. economy weakened and steel prices soared in the early 2000s, however, shipments began to wane, falling to $2.68 billion in 2000 and to $2.44 billion in 2001. Between 2000 and 2001, the value of shipments for each industry segment declined. ——. "Value of Shipments for Product Classes: 2001 and Earlier Years." December 2002. Available from http://www.census.gov/prod/2003pubs/m01as-2.pdf .